8th-ranked Netherlands downed 11th-ranked Argentina in straight sets to move to 4-0 in Pool A action of the 2018 FIVB World Championship Wednesday. The Netherlands outdid its opponent in spikes (51 to 31), digs (27 to 15) and service aces (6 to 5) to register its 5th Worlds win in a row dating back to 2014. Lonneke Sloetjes led the Netherlands to victory with 23 points, while team captain Maret Balkestein-Grothues contributed 11, including 10 spikes. Elina Rodriguez recorded 12 points, 3 from the service line, for Argentina. Anahi Florencia Tosi and Josefina Fernandez also added 10 points apiece in the loss. After faltering opening day, 13th-ranked Germany collected its 3rd consecutive win with a 3-0 result against 26th-ranked Mexico. The Dutch outperformed their opponent at the service line (6 to 1), at the net (4 to 3) and spikes (48 to 37) to secure the victory. Mexico has fallen to Germany 5 times in the last 7 meetings in World Championship play. Louisa Lippmann was dominant in the match for the Dutch, tallying 16 points and 2 service aces. Jennifer Geerties also contributed 12 points. Mexico was led by team captain Andrea Rangel, who posted 18 points, including 15 kills and 2 blocks. 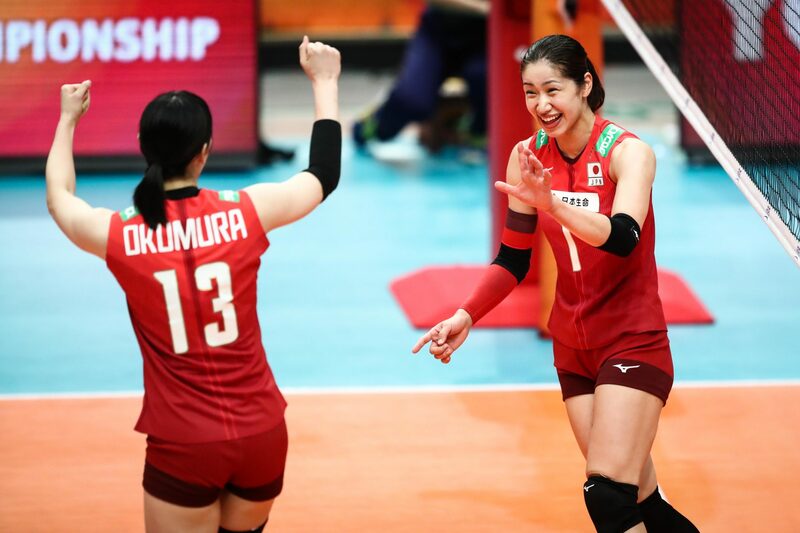 In front of a raucous crowd of 9,850 fans, 6th-ranked Japan swept past 18th-ranked Cameroon Wednesday night in Yokohama Arena. The Japanese used a strong blocking front (11 to 4) and dominant service game (7 to 0) to secure the one-sided victory. Errors were a problem for Cameroon, who committed 14 in the match, including 9 in the first set alone. Miyu Nagaoka registered 20 points for the Japanese, 16 of which were the spike variety. Ai Kurogo also notched 16 points, which included 2 blocks and 1 service ace. For Cameroon, Christelle Tchoudjang Nana and Laetitia Crescence Moma Bassoko each recorded a team-high 7 points.